MyPetGoat is proud to present a short video dedicated to our glorious leader, the one, the only, Tony Blair. It has been almost ten years since Blair took power in the UK. Ten years of sleaze, corruption, spin and unconditional slavery to Washington. Here is a look back at Blair‘s legacy. The video is just over four minutes long which is roughly equivalent to the amount of thought Blair put into his foreign policy back in 1997. Tony Blair has agreed to advise the Egyptian president, Abdel Fattah el-Sisi, who came to power in a military coup last year, as part of a programme funded by the United Arab Emirates that has promised to deliver huge “business opportunities” to those involved, the Guardian has learned. The former prime minister and Middle East peace envoy, who supported the coup against Egypt‘s elected president Mohamed Morsi, is to give Sisi advice on “economic reform” in collaboration with a UAE-financed taskforce in Cairo – a decision that has been criticised by one former ally. The UAE taskforce is being run by the management consultancy Strategy&, formerly Booz and Co, now part of PricewaterhouseCoopers, to attract investment to Egypt’s crisis-ridden economy at a forthcoming Egypt donors’ conference sponsored by oil-rich UAE, Kuwait and Saudi Arabia. But Blair‘s decision to become involved in Gulf-financed support of the Sisi regime, which is estimated to have killed more than 2,500 protesters and jailed more than 20,000 over the past year, has been attacked. A former close political associate argued that the ex-prime minister’s role in advising the Egyptian regime would cause “terrible damage to him, the rest of us and New Labour‘s legacy”. Blair‘s spokeswoman told the Guardian that his backing for “Egypt accessing support in the international community” was not being done “for any personal gain whatsoever”. He would make no money out of Egypt and neither would any of his organisations. “He is giving advice, he will have meetings, that’s all,” she said. Blair believed that the Sisi government in Egypt “should be supported in its reform agenda and he will help in any way he can, but not as part of a team”. However, he regarded Strategy&’s Egyptian work as important. The former political associate said that a bargain had been struck and added: “Tony Blair has become Sisi’s éminence grise and is working on the economic plan that the UAE is paying for. For him, it combines both an existential battle against Islamism and mouth-watering business opportunities in return for the kind of persuasive advocacy he provided George Bush over Iraq. Alastair Campbell, Blair’s former press secretary who resigned in 2003 over the Iraq war “dodgy dossier” scandal, is also advising the Sisi government on its public image and being paid for it – though on Wednesday he refused to say if he had been working with Strategy&. Blair‘s spokeswoman said the former prime minister would be prepared to introduce people in Cairo if that was “helpful”. Some observers argue that the UAE-funded Egyptian taskforce in Cairo is now said to form a shadow government within the government. Since standing down as prime minister in 2007, Blair and his companies have been awarded a string of multimillion consultancy contracts with private corporations, dictatorships and repressive regimes, including Kazakhstan, Kuwait, the UAE and Colombia. They include a contract worth more than £1m a year to advise the UAE’s Abu Dhabi sovereign wealth fund Mubadala. But his involvement with the Egyptian dictatorship is likely to be his most controversial, both because of its overthrow of a democratic government and the scale of bloodletting it has unleashed – and because of Egypt’s central role in the Middle East where he has been the peace envoy of the Quartet of the US, EU, UN and Russia since 2007. Last week a group of former British ambassadors and political figures joined a campaign to call for Blair to be sacked as Middle East envoy, citing his “negligible” achievements in the role, his defence of military intervention in Iraq and Syria and the “blurring the lines between his public position as envoy” and his private business dealings in the Middle East. Chris Doyle, of the Council for Arab-British Understanding, said his business interests and peace envoy roles were “incompatible and create a huge conflict of interest”. Sisi seized power last July as army commander-in-chief and was confirmed as president this month with 96% of the vote in a dictatorial-style election after Morsi’s Muslim Brotherhood had been banned as a terrorist organisation. Blair congratulated him on winning the support of the people and said he deserved the support of the whole international community. But he criticised the recent jailing of al-Jazeera journalists as unjustified. In April, Blair singled out the Muslim Brotherhood and other Islamists as the enemy that the west and east should unite against and hailed Morsi’s overthrow as “the absolutely necessary rescue of a nation”. Former UK Labour Party Prime Minister and Middle East peace envoy Tony Blair has agreed to advise the Egyptian president and military dictator, Abdel Fattah al-Sisi: here. Blair embodies corruption and war. He must be sacked. Now he’s advising the Egyptian dictatorship, his removal as Middle East peace envoy is a moral and democratic necessity: here. One year since the military coup in Egypt: here. Egypt: Trade union rights campaigners condemn police torture of workers: here. Worse than the dictators: Egypt’s leaders bring pillars of freedom crashing down. Adly Mansour and now Abdel Fatah al-Sisi are ruling by decrees, banning protest and severely curbing freedom of speech: here. 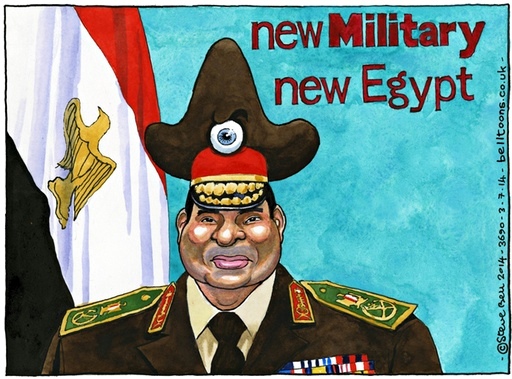 This is a Steve Bell cartoon of Egypt’s Genersal Abdel Fattah el-Sisi, advised by Blair. The slogan on the cartoon is based on Tony Blair’s slogan ‘New Labour, New Britain’. Human Rights Watch accused Egyptian authorities of gagging critics yesterday when border guards stopped its executive director and another US staffer from entering the country. Executive director Kenneth Roth and Middle East and north Africa director Sarah Leah Whitson had been scheduled to launch a critical report by the group on mass killings by security forces last summer: here. Tony Blair’s close ties to the Egyptian government have been called into question after some of the country’s key officials were accused of collaborating in the “widespread and systematic” killings of more than 1,000 protesters: here. Confident of the backing of the US and its allies, the Egyptian military regime presided over the sentencing of almost 200 people to death in a single mass trial on Tuesday: here. Egyptian dictator al-Sisi signs military, economic deals in Paris: here. On Sunday, the Egyptian military ruler Abdel Fattah al-Sisi introduced draconian “anti-terrorism” legislation by decree, further strengthening the repressive apparatus of one of the most bloody dictatorships in the world: here. Britain: Is the Blairs’ £27m property empire relevant to public anger about the housing crisis? Here. This entry was posted in Economic, social, trade union, etc., Human rights, Peace and war and tagged Egypt, Tony Blair, UAE by petrel41. Bookmark the permalink.